Let’s face it, the one thing that really changes when you have kids is road trips. No more carefree weekend jaunts. No sprawling out in massive beds or snuggling under the covers. 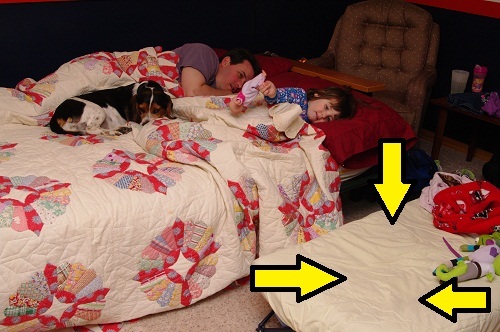 And if you have a kid (or kids) and a dog, you might as well kiss any semblance of comfort goodbye once and for all. Case in point, tonight’s sleeping arrangements in my parents’ guest room. As luck would have it, neither Steven nor I fit any of the criteria above. Even better, by the time we finally got Cadence in her pajamas and ready for bed, she had already skated past the I’m-Overtired-And-Manic Phase and right into the Look-At-Me-I’m-Delirious-And-Going-To-Run-Until-I-Literally-Pass-Out-From-Exhaustion Phase. So, after nearly 3 hours of talking, pleading, consoling, cajoling, threatening, asking, demanding, yelling, and shushing, everyone is finally asleep. Well, except for yours truly. 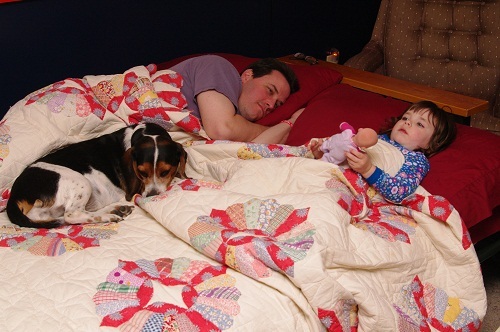 First I have to relocate the dog to the easy chair and try to unravel my husband and daughter’s limbs from the large knot of blankets in the middle of the futon.